This is an unofficial Bessemer & Lake Erie Railroad (now Canadian National Railway Company, CN) railfan page. This page has no affiliation with Bessemer & Lake Erie Railroad or the Canadian National Railway Company. The Bessemer & Lake Erie RR (B&LE) used to be a regional railroad connecting Pittsburgh PA to the Lake Erie docks at Conneaut OH. In the heydays of steel industry in the Pittsburgh, the B&LE was even a Class 1 railroad. 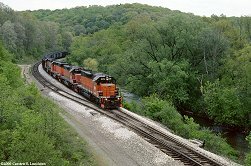 Since May 2004 the B&LE has been the Bessemer Subdivision of the Canadian National Railway Company (CN). I haven't had the opportunity to railfan the Bessemer since then, but I understand from other railfans in the area that there is little visual change to the line. Since all my own photos are from the B&LE-days, I decided to keep the B&LE identity in this portrait. Thanks to Nathan S. Clark Jr. for help keeping my informations up to date. The main part of the B&LE is in western Pennsylvania, with only a few miles of the Conneaut branch extending into Ohio. The B&LE is based in Greenville, where almost all train crews operate from. 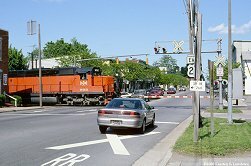 The locomotive and car shops are also located in Greenville. In its later years the B&LE was dispatched from an office common with the Union Railroad in Duquesne PA, but dispatching has now moved to the CN dispatch center. 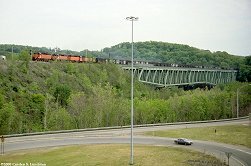 The B&LE mainline starts near Pittsburgh at North Bessemer yard, where interchange with the Union RailRoad (URR) takes place. The line then heads north, across the Allegheny River, through Butler (with interchange with the Buffalo & Pittsburgh RR), through Grove City and to Greenville. The original mainline went to Shenango (just south of Greenville) and then north through Greenville. 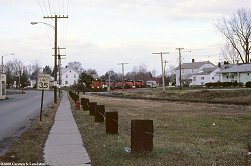 This line is still intact and in use, but through trains can use the so called KO line that bypasses Greenville. This diversion of the lines makes it a bit difficult to keep an eye on everything but luckily there are defect detectors on both sides of Greenville. The B&LE has its operations based in Greenville and it is very usual for a train to leave its cars on a siding on the main and then have the locomotives head to Greenville as light power. 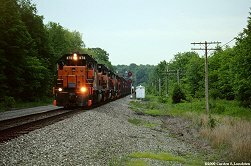 The other way around a fresh crew will often take its locomotives light from Greenville to the main and pick a train up there. North of Greenville the line heads for Albion where the main line ends. North of Albion trains continue on either the Conneaut (most trains) or the branch to Wallace Jct. The B&LE mainline is operated under Centralized Traffic Control, CTC. Train movements are authorized by signal indication, which unfortunately means that trains move across the mainline without much radio talk. 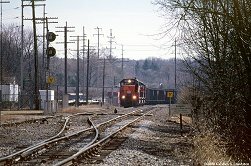 The branches to Conneaut and Wallace Jct are now controlled by Track Warrant Control (TWC) , where trains get radio permits ("Track Warrants") authorizing them to occupy the branches. Permission to enter Albion Yard, and the Track Warrants, are given by radio, and reveals train activity on the northern end of the B&LE. Radio calls to the dispatcher are prewarned by dial tones on the radio, and then the radio system responds with a triple beep to the crew to acknowledge the call. In early year 2000 the B&LE ran 2-3 train pairs per day. The best strategy for catching a train is to go to Greenville in the early morning and simply wait for the scanner to start talking. Usually radio activity means a locomotive set is leaving the engine shops where they go might be tricky to figure out. 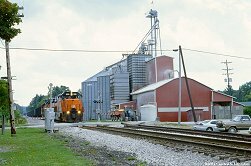 They may go to pick up a train either north of Greenville, South of Greenville or at Shenango yard by Greenville. Union RailRoad at North Bessemer Yard. 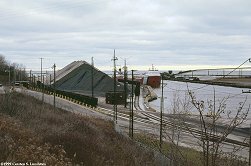 The main traffic is iron ore, that the Conneaut brings from the docks at Conneaut. 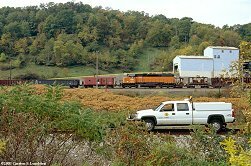 The URR then delivers the coal to USX' Edgar thomson Works in Braddock. 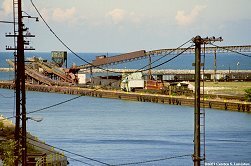 URR delivers coal from it's Duquesne Wharf, to be hauled to Conneaut by the B&LE. The interchange also sees mixed freight. Buffalo and Pittsburgh at Butler. Interchange seems to be misc. carloads of general merchandise (mainly steel-related) to/from Butler area industries connected to the B&LE. CSX at Shenango. 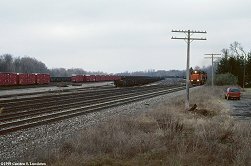 CSX usually delivers coal trains to Shenango for the B&LE to take to the docks at Conneaut. Some trains are run all the way with CSX power but most trains I've seen had B&LE power. 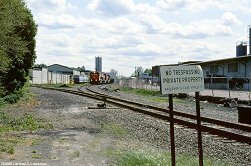 The CSX access to Shenango Yard is via NS trackage rights. NS at Shenango. General merchandise cars. CSX at Conneaut. The interchange is mostly CSX coal trains to the docks at Conenaut. NS at Wallace Jct. There are a few cars per week of general merchanside being interchanged at Wallace Jct. 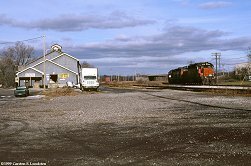 North Bessemer Yard is the southern terminus of the B&LE, and the interchange with the Union Railroad. 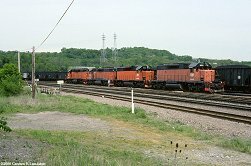 In late spring 2000 a quartet of SD38(-2)'s have delivered a train at North Bessemer and roll through the yard to pick up a train of loaded coal hoppers the return run north. By this time the first 6 of the "new" Tunnel Motors were in operation, and quartets of SD38's had replaced the earlier mix of SD38 and SD18 that was almost standard on the B&LE. 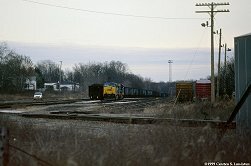 Some months earlier, in early February 2000, the very last rays of sun lit up this trio of the "brand new" SD40T-3 while they pulled into North Bessemer yard. 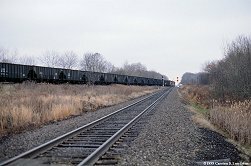 The previous fall, in October 1999, coal loads also went north. 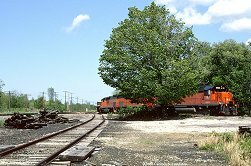 I believe this is my first B&LE photo, after I by coincidence heard a train work at North Bessemer one day. 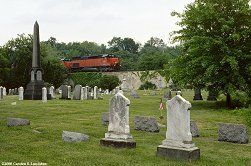 This was af few months before the Tunnel Motors began to arrive, and the lashup includes a DM&IR SD-M.
Southbound train passing the cemetary at Harmarville/Cheswick. May 2000. Jumping years ahead and jumping up north of Saxonburg, ore drag 907 South is working hard up the grade to Saxonburg. The Tunnel Motors sounded great! October 2003. Further north, at McBride, our good friend 876 North is seen just before passing under Rt 8. Looking the other way years later. 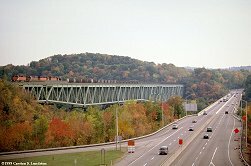 907 South in October 2003. B&LE has a daily switch job working the industries in Butler. In the late summer of 1999 we find B&LE 151 and 150 heading north from Armco Works towards the B&LE Calvin yard. 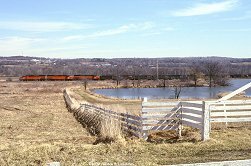 The track in the foreground is the Buffalo and Pittsburgh mainline. 4 years later, seen from the same location (a Burger King parking lot), SD38 866 has been bumped to handle the Butler industries. In the foreground is a B&P hi-railer, its driver gone to lunch in the Burger King. 905 South has set off its train of empties at Calvin yard in Butler. A short train of some 20 gondolas with scrap metal has been picked up instead, and the train is now headed south through Butler towards North Bessemer. February, 2000. 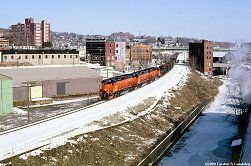 Wonderful February day, bright "new" locomotives in a great paint scheme - what more can a railfan wish for? 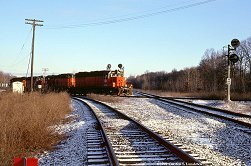 905 southbound at Hallston, February 2000. 876 is back on the point of a northbound at Carter in June 2000. The Tunnel Motors have less than a month of service on the B&LE and still look shiny and new on this winter day. 905 has just picked up a train of empties from the siding at Kremis and gets rolling southbound towards Butler. February, 2000. At my very first visit to the Greenville area I was plain lucky to find a train. I spotted the signal at KY at "Restricting", so I decided to wait and see what that was about. Not long after the roar of EMD's could be heard in the distance, working in Run 8 bringing the ore train up the KO line to Kremis Siding. This was a very common lashup on the Bessemer, SD38's in the ends, sandwiching a pair of SD18's. November 1999. The weather was quite dark, no good for an inexperienced photographer and Kodachrome 64, and sharpness leaves more than a little to be desired. But here the train heads through the junction between the KO Line and the old line and into the siding at Kremis. After tying their train down and hooking up the stationary air supply, the locomotives ran light back to Greenville on the old line. 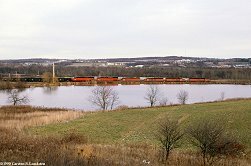 "XN" is the name of the B&LE crossing of the Erie Lackawanna (now NS' Meadville Line) at Shenango, at the south end of Shenango Yard. Trains call the dispatcher to have the signals at the crossing cleared. December 1999. The south end of Shenango Yard, as seen from the NS crossing. 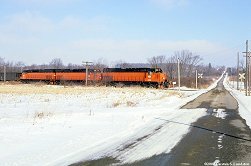 A pair of CSX GE's have delivered a coal train for the B&LE to take to Conneaut, and the units are being tied down. The crew van just arrived. December 1999. Moving up to the northern end of Shenango Yard, 2 blocks south of Greenville's Main Street, another CSX coal train is heading up the unsignaled double track through the yard (the signals are the beginning of CTC). Behind the train is the NS Meadville Line. Early March 2000. 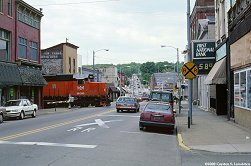 Looking the other way, the train is just about to enter the narrow passage crossing Greenville's Main Street. And certainly the passage almost hides the railroad until the gates lower and the train shows up. Pulling 3 engines and 130 loads out of the yard keeps Main Street blocked for quite a while. The other side of the Greenvile passage. 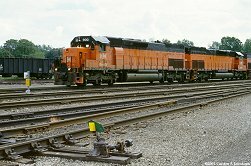 900 North is about to cross Main Street with coal loads from CSX in September 2001. Through trains can bypass Greenville using the KO line. 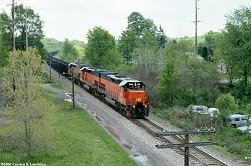 Most trains bypassing Greenville pause on a siding either north or south of Greenville. The crew ties the cars down, hooks up air from a stationary supply and take the locomotives light to Greenville. Later another crew picks up the cars and continues the journey. This southbound train was picked up north of Greenville at "KO" and then headed south towards Pittsburgh over the KO line. The grade on the KO line is moderate (part of the reason for bypassing Greenville) but still the locomotives were roaring, accelerating the heavy ore train. We're at Osgood. The track in the foreground is the NS Meadville Line, and the B&LE old line crosses under the road just behind it. June 2000. Same location. A late afternoon in September 2001 hoppers are rolling south on the Osgood Viaduct. The old line and the KO-line come together north of Greenville at at location named "KO". This is also one of the locations where trains are frequently tied down and left waiting for a new crew. A southbound train has been left behind and the units return to Greenville. December 1999. North of the junction between the old and the KO lines is a section of two main tracks. One of these tracks is usually used as a controlled siding and to park trains on. Here we are near Adamsville, around the northern end of the two main tracks. 870 is leading a southbound. It brings home the first two Tunnel Motors (900 and 901). They were picked up from the NS at Wallace Jct. December 18, 1999. 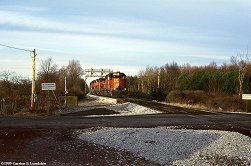 About the same location, a few months later (early March 2000) with a northbound. Shifting north a few hundred feet again, and 1½ year, to September 2001 and 900 North. Some miles to the north is Hartstown, and the rt 322 overpass. 900 North is empties for Conneaut. May 2000. Looking the other way we see one of the "classic" B&LE shots. Southbound 901 is rolling along the Pymatuning Swamp. Note the MP 96 hotbox detector. March 2000. 900 North at Conneautville. September 2001. Jumping further north to the south end of Albion yard. 870 is departing with the train carrying the first two Tunnel Motors. December 18, 1999. 900 North is hitting the scales at Albion. The scales are in the middle of the yard complex, which consists of two yards. The "A"-yard is the southernmost, with the "B"-yard north. September 2001. Albion "B" Yard is primarily used to store cars. 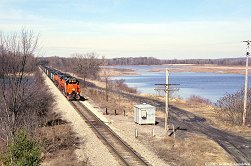 December 1999 with 873 leading a southbound. November 1999. From Albion the line splits into the two "branches". 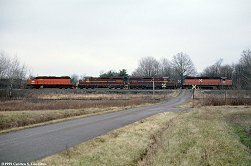 The main branch is the one to Conneaut OH where the B&LE interchanges its bulk freight with the lake freighters. 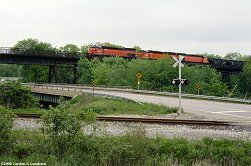 878 drops a northbound coal train down towards the harbor, under the US 20 bridge at Conneaut. December 1999. 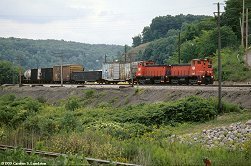 In September 2001 the trees are green, when 905 North of empty ore cars drop down the grade. From the same bridge, but this time looking north in the direction of the harbor. 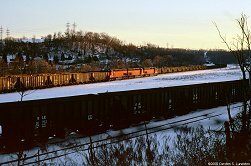 900 doubles to build its train of empty coal cars to be handed back to CSX at Shenango. The trestle in the background is the NS (former NKP) line along the Lake Erie shore. March 2000. 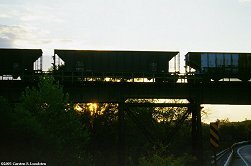 In September 2001, number 906 peeks under the NS trestle. Conneaut Yard throat, just north of the CSX overpass. Note the F-unit in the background. The F's are now out of service but in December 1999 they were still used to work the docks. Conneaut Docks. A freighter is at Dock 3, while B&LE number 900 moves to run around the train it just brought in. September 2001. Same location, same train, same lake freighter. 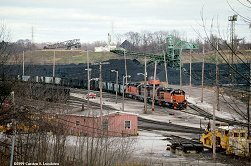 Coal is being loaded while number 900 backs down the yard runner. Looking left through the wires, ex. DM&IR number 858 is working Dock 4, the ore dock. September 2001. Not directly B&LE, but still Conneaut. As seen from the same location, Dock 1 is for inbound limestone. November 1999. Moving some 15 miles east along the lakeshore we're at Wallace Junction. It's the northern end of the Erie Branch and an interchange with the Norfolk Southern. Bessemer numbers 902, 907 and 900 picks up 4 cars from the NS. May 2000. Just a little earlier, number 900 was leading into Wallace Junction with 2 cars to drop off. A little south of there the line curves into Girard. 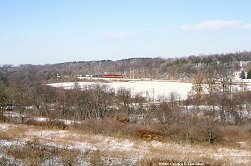 On December 18, 1999 I had heard the train being cleared to go up the branch from Albion. I drove up there and found number 870 leading a rather amusing looking train. Besides the 4 active units, the train had Tunnel Motors ( numbers 900 an 901) and 2 freight cars in tow. The Tunnel Motorshad just been picked up from the NS and were the first two to arrive on B&LE property. 902 is crossing US 20 in Girard, May 2000. Same train, halfway between Girard and Albion. 3 SD40T-3's and 4 cars - no problem going at track speed! 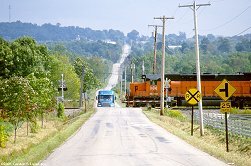 Well - the 130 empties that the train took out of Conneaut were left behind at Albion for this side trip to Wallace Jct. Later the rear flatcar is set out in Albion and the 130 empties picked up for the trip south.